This Yongjo-ri in question is at N41.35 E127.06 [41°19'47"N 127°05'02"E]. It is also known as Yongjo-dong, according to NIMA/NGA. The Yongjo-ri at 39°04'54"N 127°13'31"E is way too far south, and the Yongje-dong	at 41°59'49"N 129°58'23"E [which ia also known as Yongjo-ri, according to NIMA/NGA] is way too far east, right on the sea shore. Yongjori is located in Kimhyungjik County, Ryanggang province, about 20 km (12.5 miles) from the Chinese border. According to US intelligence, North Korea has built at least two new launch facilities for the medium-range Taepo Dong 1 missile. A launch facility for the Taepo Dong 1 at Yongo-dong was reportedly completed in 1999 or 2000. As of late 1998 workers had completed bunkers for propellant fuel and were constructing a launch platform. At that time a similar site was under construction at Chiha-ri, the technical support base for North Korea's Scud missile brigade. US intelligence had identified some construction that may be bunkers for Taepo Dong storage, from which the missiles could be rolled out and elevated into launch position. These reports may be in error, since it does not appear that North Korea has in fact deployed the Taepo Dong 1 missile. According to some reports, North Korea is believed to store mid-range Nodong missiles in tunnels at Yongjori base. The facility is said to consist of a dozen tunnels, half of which store missiles and the other half store fuel and supplies. One North Korean defector claimed that the 12 tunnels at the base could hold 36 missiles. The Nodong missile would be carried on a transporter-erector from the underground facility prior to launch. The description and location of this facility are quite similiar to the "Chunggang-up" and they may be one and the same. The short list of suspect sites for the uranium program includes the underground facilities at Yongjori, about 12 miles from the Chinese border in Yanggang province, and in Chagang province, also known as Hagap. In contrast to the Hagap Under-Ground Facility [UGF], which is immediately evident in commercial imagery, the Yongjo-ri UGF is an extremely low signature installation. 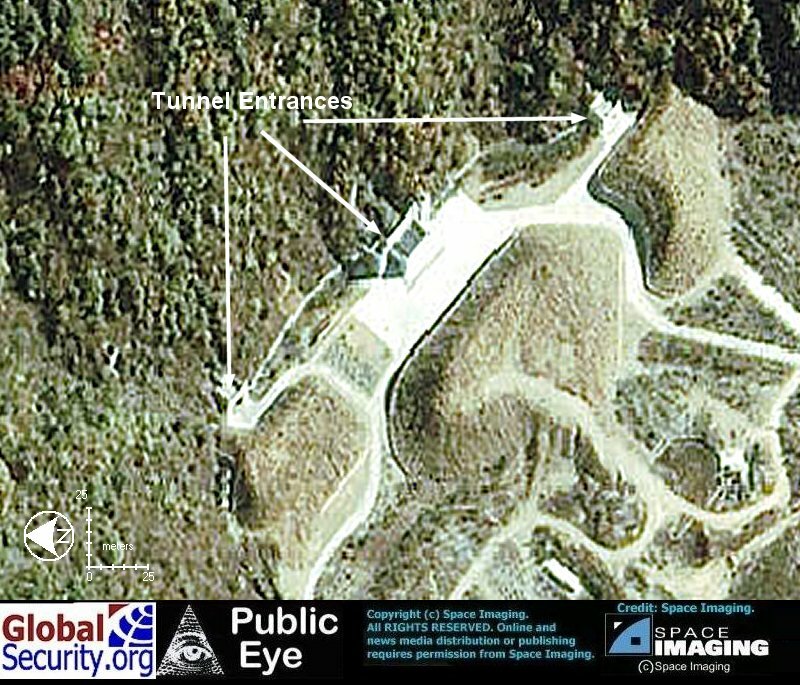 A close examination of a Japan Space Imaging image acquired several years ago reveals three possible tunnel entrances. The presence of these tunnel entrances is suggested by either by a "road to nowhere" leading to a vague albedo feature suggestive of a tunnel entrance, and/or by a short side-road running off of the main road. These features are all located at the very center of a number of scenes acquired over an extended period of time by both Space Imaging and Digital Globe. The intensely focused interest in this precise location, an extraordinarily desolate area of othewise unremarkable character, is almost certainly indicative of the presence of a special weapons facility. This location is also at the coordinates [41°19'47"N 127°05'02"E] associated with the Yongjo-ri place name. In 12 September 2004 there were reports of a huge detonation in North Korea near the border with China, Yongjo-ri near the missile base. South Korean media reported on the explosion, saying it sent up a mushroom cloud three-and-one-half-kilometers wide on Thursday 09 September 2004, the 56th anniversary of North Korea's founding. The Yonhap news agency cited an unidentified source in Beijing as saying damage was large enough to have been seen from a satellite. The agency quoted a diplomatic source in Seoul as saying the mushroom-shaped cloud was up to four kilometers in diameter. Yonhap said there had been speculation the explosion may have been bigger than the one that largely destroyed a North Korean border town, Ryongchon, on April 22, killing 170 people and injuring an estimated 1,300 others. The initial reports of a "mushroom cloud" triggered speculation that North Korea had conducted a nuclear test, timed to the anniversary of the founding of the DPRK. The lack of radiation being detected eliminated the possibility of a nuclear test. A nuclear detonation would have also produced a brilliant flash of light that would have been seen over a much greater distance than the mushroom cloud -- no such flash of light was reported. South Korea's Chosun Ilbo reported the blast site took place six miles southwest of the Yongjori missile base and 18 miles from the Chinese border. Chosun Ilbo has conducted a remarkable campaign to locate the site of the explosion using the 5-meter resoution imagery from South Korea's KOMPSAT-1 satellite [Arirang 1 unit, volatile region photographing success Chosun Ilbo 15 September 2004]. This campaign failed to detect the site of the explosion. For reasons that remain obscure, Chosun-Ilbo did not evaluate the actual location of the Yongjo-Ri Under-Ground Facility. Digital Globe made several collect attempts during this timeframe, but was frustrated by cloud cover. Pressed by a British delegation headed by British Foreign Office minister Bill Rammell which was on a visit to the country, the North Korean government agreed to eventually allow the blast scene to be inspected. Government officials claimed the explosion to have been deliberate as part of a plan to blow-up a mountain to make way for the construction of a hydro-electricity plant. Skepticism nonetheless remained due to the time of the blast, which occurred late at night; an unusual time for a construction project explosion. On September 13, 2004, KCNA released a statement regarding the explosion where it commented that "South Korea is making much ado that there was a big explosion in Kim Hyong Jik County, Ryanggang Province of the DPRK, on Sept. 9". The release claimed the media reports to be "a preposterous smear campaign [as there] has been no such accident as explosion in the DPRK recently". The statement also attributed the explosion to "blastings at construction sites of hydro-power stations". According to another KCNA release, "the British side hoped that an on-field inspection of the site would be arranged for the diplomatic corps here, and the DPRK side met this request with pleasure out of good faith." That visit took place on 16 September 2004 when an international delegation from Germany, Britain, the Czech Republic, Mongolia, Poland and Sweden visited the supposed location of the explosion and reported seeing a "huge construction site." According to a report by Japan's NHK network, several hours of air and overland travel was needed by the diplomats to reach the blast site. But the site where the cloud was observed and the hydropower station construction site are clearly different and very far apart. 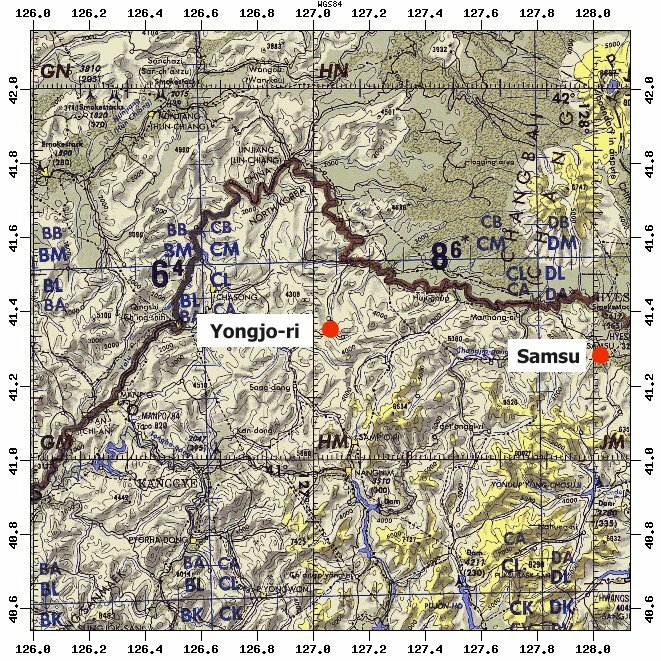 The place where the explosives were detonated, as the North has argued, is Samsu County, 90 kilometers away from Kim Hyung-jik County. The construction of the dam has been under way in Samsu County since May 2004. Confusion about the event was compounded on 17 September 2004 when South Korean vice minister of unification Rhee Bong-jo announced that there had been no explosion to begin with. He stated that the initial mushroom cloud had been a natural phenomena and might have been just a regular cloud while the reported seismic activity actually took place around Mount Paektu, an area on the Chinese border. Some security analysts attributed this confusion to a failure of intelligence combined with heightened fear of North Korea's nuclear weapons program. on 19 Septembe 2004 the head of the International Atomic Energy Agency called for North Korea to allow international experts into the country to completely verify that a large cloud recently spotted over the country was not caused by a nuclear explosion. IAEA Director General Mohamed ElBaradei pointed to conclusions by US officials and others that a huge cloud spotted earlier this month over North Korea was not caused by a nuclear event. But he told CNN's "Late Edition" that Pyongyang should allow international experts into the country to make an absolute verification of North Korea's claim that the cloud was not caused by any nuclear explosion.